Remember the Jide Remix tablet that was announced back in January? The device is already available in China, and now Jide is getting ready to sell it around the world. The company launched a Kickstarter campaign that lets users order the slate from the US, Canada, Australia, UK, and most European countries. Right now, you can buy a Remix tablet for $349, and expect to get it in May. 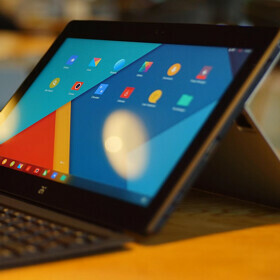 Interestingly, Jide allowed 355 early adopters to get the tablet for just $39 (that's thirty nine US dollars), hoping to receive feedback from them in order to improve the slate's OS - which is called Remix OS, and is based on Android KitKat. As we told you when we first presented the Remix tablet, this resembles Microsoft's Surface Pro 3. It offers a 11.6-inch display with 1080 x 1920 pixels, a detachable keyboard, and a kickstand. Powered by a quad-core 1.8 GHz Nvidia Tegra 4 processor, the slate has two 5 MP cameras (on the front, and back), 2 GB of RAM, 64 GB of expandable storage space, and a 8100 mAh battery. As for Remix OS, this reminds us of Windows, coming with features like a file manager, a taskbar, and multi-window support. Jide is a China-based company founded by three ex-Google employees. It presents the Remix tablet as a "mobile productivity device." Is anyone here considering getting one? I don't know how will they sell this in the US, or anywhere MS filed its design patent for that matter. This is straight-up Surface 2, both in design and spec (for the most part). I wounldn't mind that functionality in a form of a launcher for my Z Ultra. Quite bulky for an Android tablet otherwise ok. The power of Andro..... wait...... It is the power of Linux kernel, the power of open-source and freedom. What's the point of this tablet it can't open a Windows program. More than 80% of todays tablet are non windows tablet. I am very happy with the non windows alternative out in the market. Was thinking about being one of the early adopters, really regretting not doing so now haha.